Through Instructional Design principles, we’ve totally redesigned and redefined how a policy works. These policies are real game-changers. This is an exciting development that provides important safeguards for company owners and managers. If you can’t find what you need from our existing policy sets, our writing team can help. Call us with your exact requirements. We know how important your social care policies are to the leadership of your business and the quality of your services. Therefore, we’ve worked hard to make them better. Finally, social care policies that match your standards and ambitions for your business. You could be at risk if you don’t have your social care policies in order! Your policies communicate your standards and expectations to your workforce. Therefore, without clear and effective policies, you are not giving your staff the support and guidance they need. Regulatory bodies, such as the CQC or Care Inspectorate, the Health and Safety Executive and Local Authority Safeguarding Boards, place a high importance on your policies. This is because they provide evidence you are operating responsibly and that your business is being well-led. 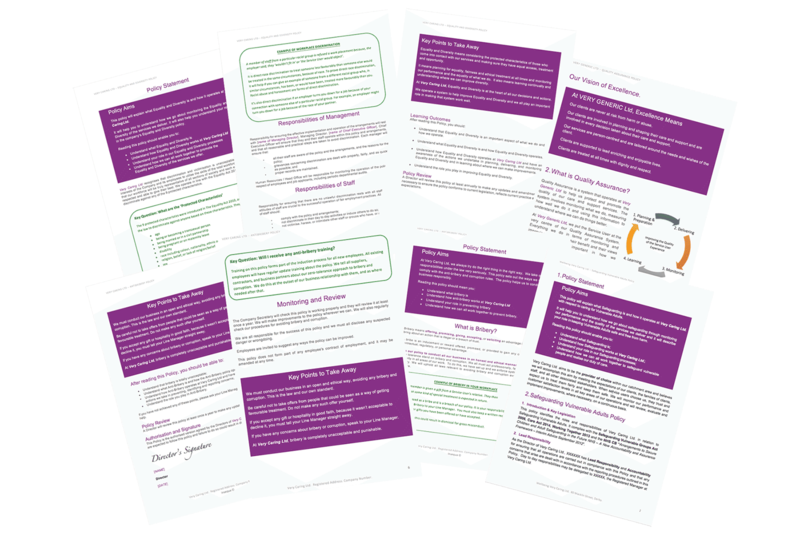 Insequa has compiled an extensive library of social care policy templates that are available as innovative ‘Instructional Design‘ policies. These are designed to communicate much more effectively, be easier to read and understand than normal policies, and which reinforce key ‘take away’ points. Another offer in our Policy Writing Service is that we can write bespoke policies to order. If you can’t find exactly what you need in our library of download policies, this may be of interest. This approach provides a unique, tailor-made policy or set of policies specifically for your company. Get in touch now and talk to us about your exact policy requirements.